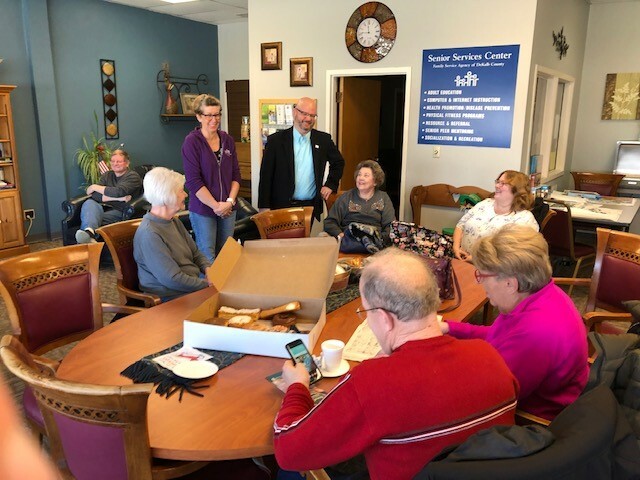 Local seniors came out to the DeKalb Senior Center on Saturday to find out whether the State of Illinois is holding unclaimed funds owed to them at an I-Cash event sponsored by State Representative Jeff Keicher. I-Cash is administered by the Office of the Illinois State Treasurer. Property is returned to the original owner of their heirs at no cost with the proper identification. Common types of unclaimed property include checking and savings accounts, uncashed wage and payroll checks, uncashed stock dividends and stock certificates, insurance payments, utility deposits, customer deposits, accounts payable, credit balances, refund checks, money orders, traveler’s checks, mineral proceeds, court deposits, uncashed death benefit checks and life insurance proceeds. Unclaimed property does not include real estate or vehicles.